Elon University in Elon, North Carolina, hosted Dr. Robert K. Musil Musil for a week as a Woodrow Wilson Visiting Fellow and has joined the Rachel Carson Campus Network. Over the past decade, under the leadership of President Leo Lambert, Elon has emerged as a leading liberal arts college known for global engagement, student success, sustainability, and the beauty of its campus. 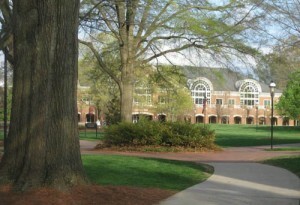 Elon has grown rapidly, adding LEED-certified buildings while maintaining classic collegiate architecture. Elon, a member of the Association for the Advancement of Sustainability in Higher Education (AASHE) features a sustainability master plan, bio-fueled campus shuttles, a campus forest, and a sustainability walking tour on its web site. Elon also has a Center for the Environment, headed by biology professor Janet McFall, which is housed at Elon’s Loy Farm where the university is also building a massive solar power array. At Elon, President Musil delivered the James P. Elder Endowed Lecture, “Elon and the Legacy of Rachel Carson Today,” urging students and faculty to be engaged in issues that Rachel Carson cared about including toxic chemicals, nuclear wastes, animal factory farming, and global climate change. While at Elon, Musil also met with President Leo Lambert and Provost Steven House, taught numerous classes, and was the featured speaker for three sessions of [email protected] a large lecture series at Elon offered to adults in the community.